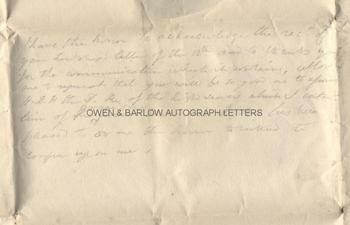 ROBERT JENKINSON 2nd EARL OF LIVERPOOL Autograph LETTER Cover Signed. 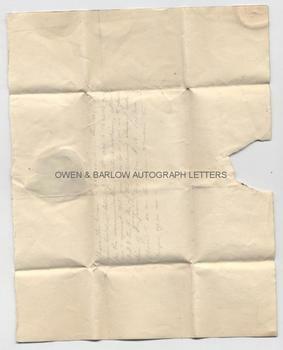 Autograph LETTER Cover, Signed and addressed in his hand "Private. 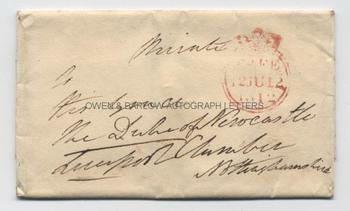 To His Grace The Duke of Newcastle, Clumber, Nottinghamshire". 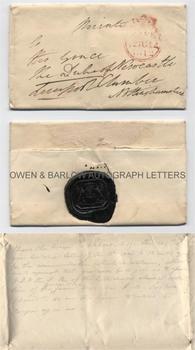 With Free Frank dated 12th June 1812 (4 days after he became Prime Minister) and with his very large black wax seal on verso impressed with a good strike of his heraldic arms. Written in pencil inside the cover is what appears to be a draft of a LETTER to the Prince Regent accepting political office (as Prime Minister? ): "I have the honour to acknowledge the recpt. of your Lordship's letter of the 12th and the communication it contains. Allow me to request that you will be so good as to assure H.R.H. the P[rince] R[egent] of the high sense which I entertain of the gracious favour that his R.H. has been pleased to do me the honour to intend to confer on me." The note appears to have been appended after the letter cover was folded, either as a reference to its contents, a draft of what it was to contain or a draft of the reply. The supposition that it is a draft is strengthened by the fact that the word "gracious" has been added, honorifics are abreviated and that the text is apparently unfinished. Although dated so shortly after Liverpool had been appointment as Prime Minister, the draft is unlikely to relate to Liverpool's appointment but is more likely to be the Duke of Newcastle's draft response to an offer contained in the letter of a post in Liverpool's government, Nevertheless, interesting. 4to folded sheet, measuring approx 9 x 7 inches (5 x 2.75 inches when folded). Mounting traces to verso, else fine. Liverpool was the longest serving Prime Minister since the Union with Ireland in 1801. His premiership covered the end of the Napoleonic Wars and is noted for the harshness of the repressive measures which were introduced to maintain order in a period of radicalism and public unrest. Liverpool's period in office saw the war of 1812, the Peterloo Massacre, the Corn Laws, the Congress of Vienna and the emerging issue of Catholic emancipation.